The Tri-Cities Exchange Club focuses on four national programs including prevention of child abuse, community service, Americanism and youth. We have established annual events that help us raise funds to support our programs. We have hosted a spaghetti dinner each fall for nearly 20 years at the Moose Lodge in St. Charles and it has consistently drawn as many as 400 patrons. Our annual Draw-Down dinner raises more than $18,000 each year for our programs. For the Draw-Down we sell 200 or more raffle numbers that put participants in a game that could net $3,000 or more in prize money. Of course, we wouldn't be able to do it without Don Regole (right). He sells over 100 tickets every year! Every holiday season, from Thanksgiving to Christmas, you can find most of our members our ringing the bell for the Salvation Army. And we are proud to note that in 2013 and 2014 the Tri-Cities Exchange Club has ranked first among all of the bell ringing groups in the St. Charles area. It must be our smiling faces. 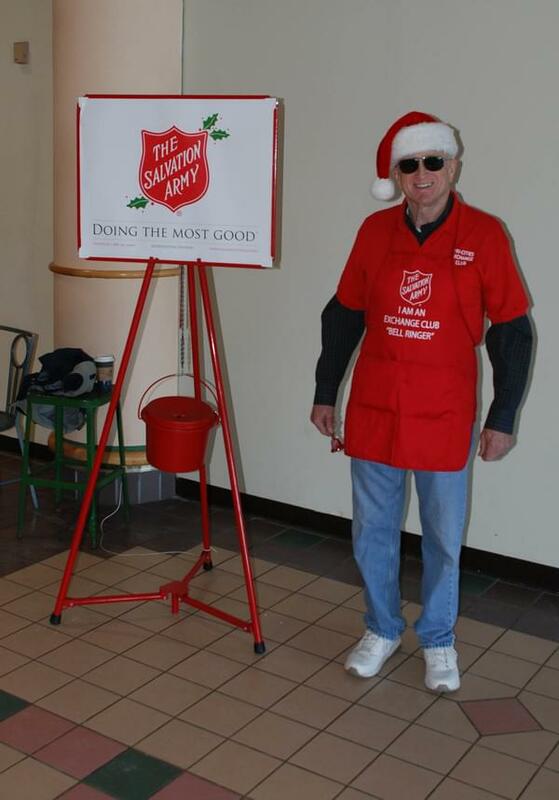 That's Ray Hauser ringing the bell at Charletowne mall in 2012. Tri Cities Exchange has partnered with the St. Charles History Museum to hold an Annual 50/50 Raffle in June. Last year the winner received over $10,000 and we plan on beating that this year. Look for us around the Tri-Cities to enter - or CONTACT EXCHANGE directly. Volunteering our time to help the organizations we support is as important to us as the time we spend raising funds to support them. You'll find us helping out at 5k charity runs, donating our weekend time at festivals and various charitable causes, joining hands around the courthouse in support child advocates, doing what we can to help those who need us most. Here's John Anderson and Bob Engel volunteering at a St. Charles Chamber of Commerce event, introducing people to what the Tri Cities Exchange Club is all about.